You still have time to make one last strawberry pie before the season is over! We highly suggest you try this strawberry balsamic pie for truly one of the best pies you’ll ever eat. The sweetness of the strawberries paired with MiaBella Traditional Balsamic Vinegar is out of this world. Perfect too for this in-between pie time we’re in. It’s almost time for pecan and pumpkin pies but it’s still 80 degrees outside. Yeah, we'll take this Strawberry Balsamic Pie as our consolation prize. Our delicious consolation prize that pairs well with Champagne. Plus people are always over the moon excited when you show up with a pie you actually made. It’s such a special treat! And if you really want to impress people there are so many options for adorning the crust of your pie. This time around we added a couple of braided pieces to add some visual interest to our lattice top. You can also go to town with some cookie cutters and and add shapes, letters etc. If you're hesitant about pie making you can go the traditional route and top the pie with a solid sheet of crust just don’t forget to add some air vents for the filling. You can make the crust portion of the recipe a day ahead of time and leave the pie plate with crust in the freezer overnight with the remaining crust kept in the fridge until ready to use. We served our pie with a scoop of vanilla bean ice cream and for bonus points topped that with a drizzle of MiaBella Traditional Balsamic Vinegar. Whisk together the flour, salt, and sugar in a large bowl. Add the butter to the flour mixture and toss to coat. Using a whisk or pastry blender, cut the butter into the flour until only pea-sized pieces of butter (or smaller) remain. Roll out one of the pie discs into an 11-inch round. Use this to line the pie plate leaving a 1-inch overhang around the edges. Wrap in plastic wrap and freeze for a minimum of 30 minutes. Roll out the second pie crust disc into an 11-inch round. 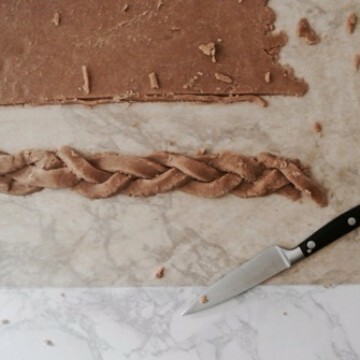 Using a pearing knife, cut into long thin strips for the lattice. Place back in the refrigerator to chill. Remove the pie crust-lined pie plate from the freezer. Drain the strawberries of as much excess liquid as possible (mine didn't have enough to drain). Toss with the grated apple pieces. Sprinkle with the MiaBella Balsamic Vinegar and Angostura bitters. 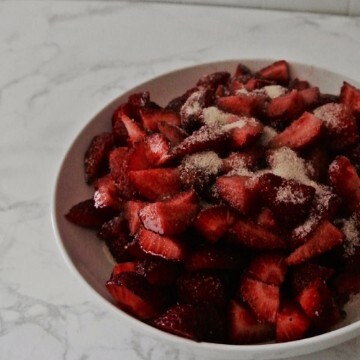 In a separate bowl, whisk together the sugar, cornstarch, black pepper, and salt(we used our MiaBella Fleur de Sel) Pour over the strawberry mixture and gently fold together until well combined. 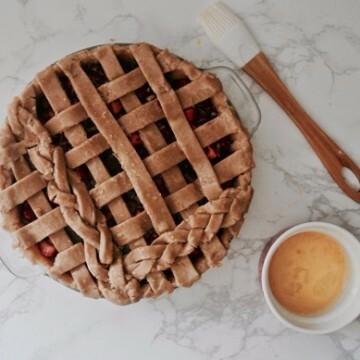 Pour into the pie shell and arrange the lattice on top. Crimp as desired. Remove the pie from the fridge and brush the pastry with the egg wash. Sprinkle with sugar.